Home Headlines & Breaking News Beersheva Bank Robbery: Robber Fell on Hard Times! Beersheva Bank Robbery: Robber Fell on Hard Times! According to preliminary information released by police following the Bank Hapoalim robbery on Monday afternoon 11 Sivan 5773; the perpetrator was not after money. Shortly after the event ended police indicated it appeared to be more than a robbery since the bank branch targeted is a mortgage bank, a branch that generally does not keep cash on hand. In addition, when the perpetrator who ultimately took his own life, entered the bank, he began firing randomly, without prior warning, leading police to believe it was not money he was after. Initially, reports described the perpetrator as an Arab from the Negev community of Rahat but police report this is incorrect. In actuality, the dead assailant was a Jewish man who was the victim of financial ruin, a former officer in the IDF and border police. 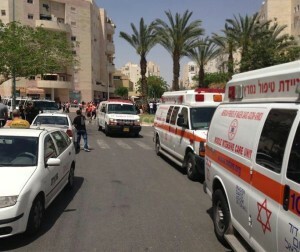 Four people were killed by the gunfire in the bank at Jabotinsky Street in the N’vei Ze’ev area of Beersheva. One male, who was transported to the trauma unit of Soroka Medical Center was described in moderate-to-serious condition with multiple gunshot wounds when taken into surgery. There was speculation that he was a second bandit but it appears this was not so. Police are explaining the assailant was 40-years-old, a resident of Beersheva who fell into hard times. He arrived at the bank earlier in the day to address his debt. When things did not work out, learning that his credit card was blocked, he left the bank only to return with a weapon, opening fire at innocent bank clients and employees. This is so sad, a desperate action by a desperate person resulting in innocent deaths. we learn from this incident that we must always realize that parnasah is beyad HASHEM and our hard times are very important for us to use it to daven better to him.